Overdose deaths tied to heroin fell by 15 percent in King County last year, but the number is still far higher than in the past. There are other signs, too, that heroin addiction remains a serious problem. Overdose deaths linked to heroin fell by 15 percent in King County last year, but health and law-enforcement officials warned that doesn’t mean the problem is waning. Heroin was involved in 132 deaths in the county in 2015, down from a peak of 156 deaths in 2014. But that’s still higher than the 99 heroin deaths in 2013. “It’s still elevated, for sure,” said Caleb Banta-Green, one of the authors of the annual report released Tuesday by the University of Washington Alcohol & Drug Abuse Institute. And there are other signs that heroin use remains a significant problem. For the first time, admissions to treatment programs for heroin surpassed those for alcohol, the report showed. In 2015, there were 3,016 treatment admissions for heroin, compared with 2,730 for alcohol. Those numbers include people who were admitted more than once. First-time admissions for heroin treatment rose sharply, from 573 in 2014 to 687 last year. They were mostly fueled by a jump in admissions among young people, those ages 18 to 29. “They’ve never been in treatment and heroin is their primary drug,” Banta-Green said. Drug-addiction treatment case­loads in the region have been increasing steadily, from an annual average of nearly 2,900 in 2014 to nearly 3,400 in 2015, data show. Overall, there were 320 drug-caused deaths in King County in 2015, up from 315 the year before, the report showed. Deaths from methamphetamine, 86, and alcohol, 102, were both up. 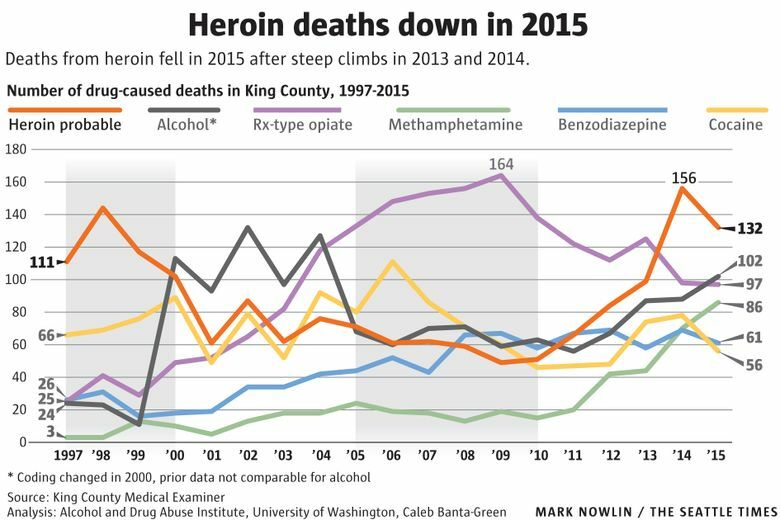 The report, an annual snapshot of drug deaths, comes amid a renewed focus on heroin in King County. In March, King County Executive Dow Constantine and Seattle Mayor Ed Murray formed a new task force aimed at expanding addiction treatment. 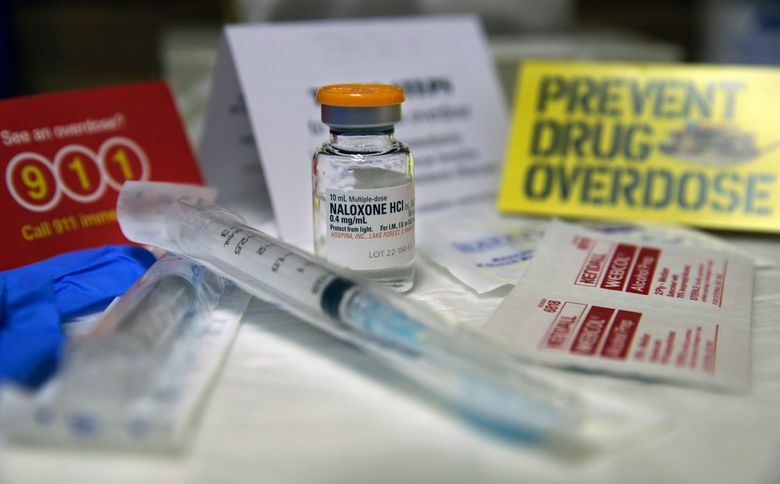 At the same time, in March, bicycle police in Seattle started carrying naloxone, a drug that can immediately reverse overdoses caused by opiates, including heroin. So far, they’ve reversed at least nine overdoses. Such focus could have true impact, Banta-Green said. In 2000, amid rising numbers of heroin deaths, a county task force helped expand methadone treatment — and deaths fell. Banta-Green said he hopes it can happen again.